A review of our first eating experience at The Star Inn has already been posted here. The menu and cooking were great and it was obvious we would visit again. 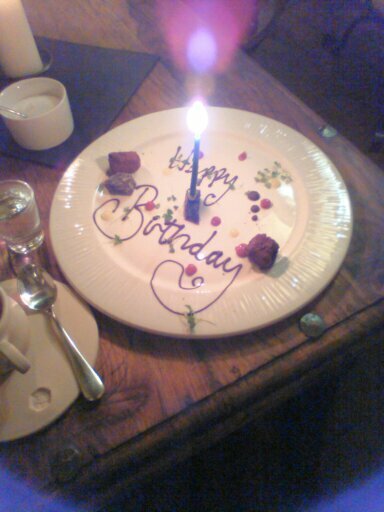 My sixty-fifth birthday merited some special celebration and Jan and I chose to book for dinner at Harome on the day. That first review was pretty heavy on the details of an almost flawless meal. This account of my birthday dinner will be lighter on that score. But please don’t think that the food was any less enjoyable. All courses matched the quality which we were expecting. As previously, Steve Smith led the kitchen brigade and ensured that things were right in so many ways. And I finally treated myself to the stuff of legend… the Black Pudding and Foie Gras starter. Earlier in the day I’d been treated to ‘Black Pudding and Foie Gras’ in another guise. We didn’t set off for Yorkshire before a few presents were opened. My son and his partner insisted that I unwrap their thoughtful and very welcome choice for me before leaving home. There is a smattering of Andrew Pern’s Star Inn recipes on the internet but it was terrific to finally have his first book for easy and indulgent reference and as more inspiration for my future kitchen exploits. I quickly posted news of my latest luxury on Twitter and Instagram and we headed to our destination over the Humber. After arriving at our B&B I linked with the internet and picked up reactions from Andrew Pern and a certain @evapoppa. Eve did not need reminding. She had recently been confirmed as Restaurant Manager and was trading on the skills which are a necessity for that role. In other words, she had already begun to assess the needs of the couple presenting themselves and to finely judge the level of verbal communication required. I have nothing but the deepest admiration and sympathy for all those who are given that task with me. For the rest of the night Eve was our consistent guide through food and drinks and the giver of insights and information on just about anything we cared to mention. This might be the best place to give my thumbnail sketch of the woman who orchestrated our visit. The visual impact of Hazel O’Connor in her 1980s’ pomp... mashed up with Aladdin Sane era Bowie. All brought up to date of course and chock full of that splendid attribute of being able to adapt and respond to different people to make them feel valued on many different levels. Add in the delightfully mischievous danger of Shakespeare’s Puck from ‘A Midsummer Night’s Dream’ and you have a picture of the mascara magician and partner of the local postman who devoted her entire evening to us. She also did the same for all the other diners. See... limitless talent! As if all that weren’t enough, she also teaches her two year-old dance moves to music by the Chemical Brothers. Woah… I rest my case. We gave no prior indication that this was a particularly special occasion. The only clue might have been the bit of fancy packaging for my book in that picture. I can only suppose that my casual promotion on social media had generated a few pre-planned treats. Eve told us that Andrew Pern wanted us to start with a flute of complimentary fizz. Very nice. While making our menu choices, Eve gave us a heads up that the kitchen would be presenting the turbot dish to us as an extra course. Even better! We enjoyed a great meal with the usual accent on local produce and with flavours and textures given masterful touch by the kitchen. Stupidly, I cannot remember the wine chosen with our food but we got interested in, paid for, and came away with a bottle of ‘Pernshire’ Burgundy. This was from a relatively new range of wines which Andrew has sourced. As yet unopened. Christmas 2017 might just offer a food pairing at Cheoff Towers. As I said, we had given no indication that anyone was celebrating anything. So there was one final touch which had to have been worked out on the night. While we considered the wine list, Jan told me it was my choice entirely as it was my birthday. Jan confirmed later that Eve had overheard and checked with her for confirmation through silent gestures. Which is why a couple of hours later my coffee was accompanied by musing on all the positive delights of reaching state pension age and my very first (and only) embarrassingly pleasing mini birthday plate of petits fours. We have visited and eaten again since for another wonderful lunch. Discussions with Petruţ Salaru, our wine waiter, were delightfully relaxed and informative. In a completely different style, Alex Pern fronted the restaurant and gave us equally natural and accomplished attention. This place exudes human warmth and competence. What a silly business that Michelin do not take service into account. The Inn at Harome should have a second star just for that. Oh - and a third for Eve’s contribution alone!